I have long thought that the most interesting study of atheism in this century is that of German Fascism during the Nazi regime. It is important because today’s atheism in America is repeating many of the same principles and yet, like Hitler, is calling everyone else, and primarily Christians, fascists or bigots. 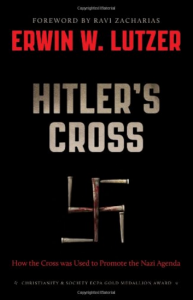 Lutzer writes to the church about the failures of the German Christians to take a stand against Hitler. I don’t agree that the church should have been more politically involved (or even could have been), but there is no doubt that physical persecution exposed the shallowness of German churches who thought that they were the strongest of any. There is an unfortunate tendency here to over-eulogize a Neo-Orthodox theologian like D. Bonhoeffer.